Randy Rosenthal signs his oblation on the alter. At Sunday vespers Randy Rosenthal made his Oblation as a Mount Michael Oblate. Afterwords a reception was held in the monastery. Literally translated, an "oblate" is an offering, or someone who offers himself or herself to God. In the world today, Oblates of St. Benedict are everyday people who seek to live extraordinary lives of devotion. 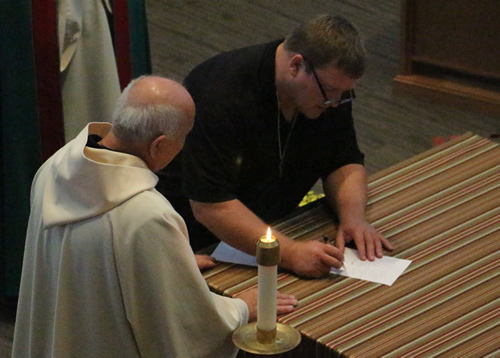 Because Oblates of St. Benedict offer themselves for the service of God in their everyday lives, in so far as their station in life permits, they come from and continue to live out their faith in all walks of life. They might be farmers, office or industrial workers, homemakers, students, bankers, health care workers, lawyers or teachers. They may be Catholic or non-Catholic, young or old. 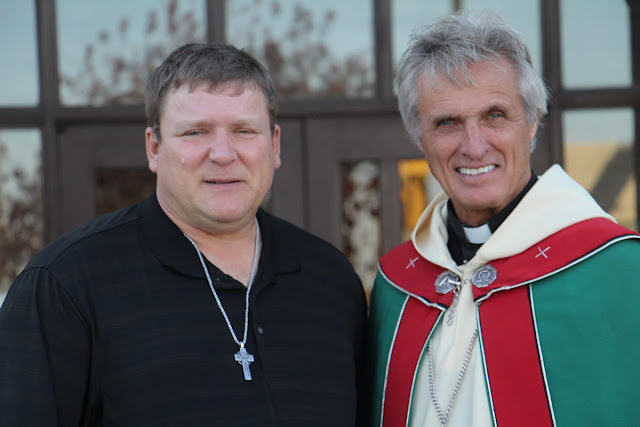 Randy Rosenthal and Abbot Michael Liebl O.S.B.